Here at Rob Web Joy we offer both advanced and basic website creation services. Our basic package covers the basics of what you will need to get a credible website started. This basic package costs $120 and includes one domain with privacy protection (if available for your TLD of choice), one secure socket layer or SSL certificate, one year of shared C Panel website hosting and one WordPress installation. I will personally set this up for you and have your WordPress login credentials back to you within 48 hours. TLD means top level domain. In other words it’s the extension of your domain such as dot com, dot net, dot org and so on. The TLDs available for this offer include .com, .net, .org, info, .biz and .us. 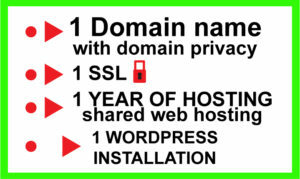 Please note that domains, domain privacy protection, web hosting and SSL certificates require annual renewal.